In a Nutshell: Many artists in today’s society have a difficult time making livable wages at their craft and are forced to work more traditional jobs to pay the bills. While the concept of the “starving artist” is not a new one, artists today have opportunities that were not available to previous generations. 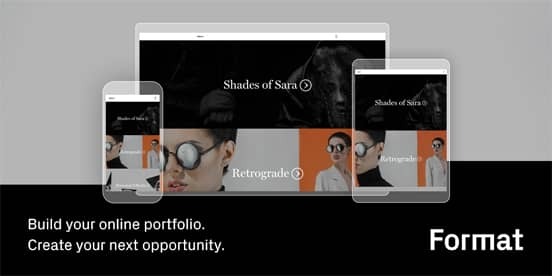 Format is a platform that lets visual artists easily and affordably create professional portfolio websites without having to hire an expensive website designer or learn how to code. Artists can showcase their work and even create online storefronts to sell pieces or promote their work, giving them the opportunity to make money doing what they love. As a writer, my circle of friends and colleagues includes artists of all types. I know many extraordinary and gifted individuals who dream of making a sustainable living off the beautiful art they’re creating. Unfortunately, with the high cost of living, most of them are unable to make it on an artist’s earnings alone. Taking on a more traditional job seems like the only way to survive for many of these creative types. One friend, in particular, is a gifted visual artist, who specializes in creating vibrant paintings and drawings of the land and plant life of the country where he was born: Mexico. However, to afford his rent in Southern California, he works at a hardware store for around 30 hours a week. Artists, like my friend, dream of making a living at their crafts just as other artists have for centuries. Modern artists have the ability to promote their work via social media and other online outlets, which means they have the opportunity to reach a huge audience and establish a following. However, within the promise of that model is also a problem: increased competition. As more visual artists — painters, photographers, graphic artists — promote their work on sites like Etsy and Instagram, it’s becoming harder to make a unique impression. One company, however, is trying to cater to these artists, giving them an affordable way to create a professional portfolio online and helping them stand out from the pack. Format is a website-building platform that lets visual artists easily create and maintain a portfolio site, without the need to learn complex programming or code. We recently spoke with Zaeem Sarwar, Head of Direct Marketing at Format, and asked him what makes Format different from the other site-builders out there. When artists display the fruits of their hard work and talent, it’s important to ensure the best and most professional presentation possible. You wouldn’t display fine art in a dimly lit museum, for example. If an artist wants to be successful in setting himself or herself apart, a professional website portfolio is a key component. 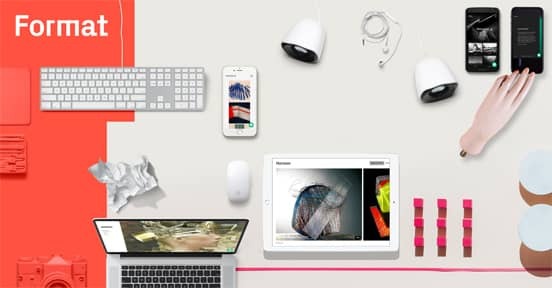 Just as lighting in a gallery plays a crucial role in how art is viewed, a professional online portfolio can influence how an artist’s work is perceived. The many themes and templates Format has created are designed with this in mind. A highly visual, professional portfolio website is an important step in winning over new clients. Zaeem also told us about some of the unique features Format has incorporated into its online portfolio builder. He explained one of the tools used by photographers is Adobe Lightroom and how Format has made it simple for them to make this a part of their workflow. Another feature of Format is the ability for artists to create and maintain online stores alongside their portfolios. Through these built-in storefronts, artists can both advertise and sell their work. Zaeem told us this storefront can be turned on with a single click and is quick and easy to set up, which is a great feature for anyone looking to start making money from their art right away. Another way to use the storefront feature is to create sample packages of work you’ve previously done and advertise it as a package within the storefront. For example, let’s say a wedding photographer or videographer wants to show different examples of work they’re capable of doing and wants to price these packages accordingly. Potential clients can then browse the work, see the pricing, and click to buy the package they want. For an artist with even a modest amount of previous work to show off, this online store feature can create a quick source of income. Painters and graphic artists can also use the storefront, both to display new pieces or to generate cash from work they’ve already done. Even the most basic Format pricing plans allow for a storefront, and they start at just $6 a month. One of the more flexible features of a Format portfolio website is the ability to manage and maintain it from anywhere, using an iPhone. The app can be downloaded from iTunes and allows you to upload images and manage your portfolio from wherever you are. Photographers find this feature particularly useful, allowing them to upload and manage their work on location. Format websites are designed to look great on every device, including desktops, tablets, and smartphones. Format website portfolio pages are also designed to be optimized for various devices. It’s just one more example of the company’s attention to detail. When potential clients see your portfolio looking just as good on their mobile device as it does on a desktop, it further reinforces the image of professionalism. Format has made creating and managing website portfolios simple and easy to use. Templates are flexible and dynamic while allowing for creative expression. This is truly a website builder designed for artists, giving them the ability to earn extra income while following their passion. If the future of work is a gig-based economy, Format is helping visual artists get there more effectively.